Clarets boss Sean Dyche insists there are no hard feelings over the summer departure of skiper Jason Shackell to Monday night’s opponents Derby County. 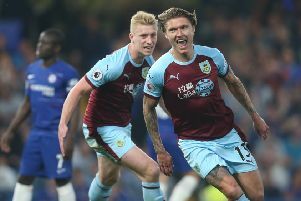 And Dyche has reiterated his beief that the 33-year-old promotion-winning captain was “a good servant” in his four years at Turf Moor. Shackell left Burnley for his former club in the summer, with the Rams paying in excess of £3m for the centre back. Dyche said at the time: “You can safeguard to a degree but if a player decides ‘That’s it, I’m not willing to work how you work, don’t want to be part of it’, which Jason Shackell made a decision on, well then they’re no use to you. “They have to be involved in what you do, they have to be motivated in what you do, they have to be motivated for the club and what it stands for. “Jason had just made a decision it was time for him to move to pastures new. A big part of that was the finance involved and that is the reality of the game now. But, ahead of Monday’s televised game, Dyche admitted: “We know him well and he knows us well. “We have different players now so that will affect the way we work, and gives a different slant on what he’s used to here. “He’d been a great servant for me, some of the media tried to give a weird angle when he left, I just told it how I factually thought it was. “But he’s been an excellent servant for me as a manager, and before me I know he did well. Derby failed with at least three offers before getting their man, and Dyche explained: “It was a simple business, the reality of football. someone offered some money, we said no, someone offered some more, we still said no, they offered some more, we said no, they offered a bit more, we said no, then they offered enough, and we said okay. Derby were the Championship’s biggest spenders over the summer, but had to wait until their sixth league game for their first win, and they go into Monday’s game with back to back victories, against a Burnley side with four wins on the spin. Dyche said: “You look at the money they’ve spent on some good players, one who was one of ours, and some good signings. “If anyone out there was thinking they weren’t going to win games it’s probably silly of them. “Everyone knew they’d win games and they have done. “They’ve got a young, first-time manager who wants to make a mark and he’s at a club where everything is kind of in place but they’ve still got to deliver. Paul Clement has come into Derby after the departure of Steve McClaren, although he has brought in many of the plauers who were on loan at the iPro Stadium last season, such as Darren Bent and Tom Ince: “I think like most managers there will be subtle changes. “He’s mixed around with formations and is probably looking for his true starting eleven and true shape, probably slightly differently than Steve McLaren was. “We know about the opposition but we really focus on ourselves. We’re aware of the opposition but we have to focus on ourselves to give true, real performances and that’s what we looked to do. “We’ve certainly done that over the last four games, and beyond that. “I wasn’t over thinking the first two or three games of the season. I thought there were some really good parts of our games. Dyche isn’t expected to change a starting line-up which has been unchanged for the last three games, but he didn’t rule out Joey Barton featuring in the squad for the first time since his arrival: “He’s going well. He’s the end of week three on his personal pre-season. “Usually pre-season is about five weeks, but we’re not necessarily going to hold him back five weeks but that’s the kind of timescale, he’s worked very hard, in on his days off to make sure he’s catching up.